Longhorn cattle producers won't be in the business very long before they will need to brand, doctor or castrate. When we first went into the Longhorn business in 1967, our first calves were branded squeezed to the inside of an old stock trailer. We did a horrible job. Later we took them to a squeeze chute owned by a neighbor. It was just slightly better. The day finally came when we purchased a high quality Powder River chute. Powder River has been in the business since dirt, and have pioneered and perfected some of the very strongest and best thought-out cattle chutes in the world. 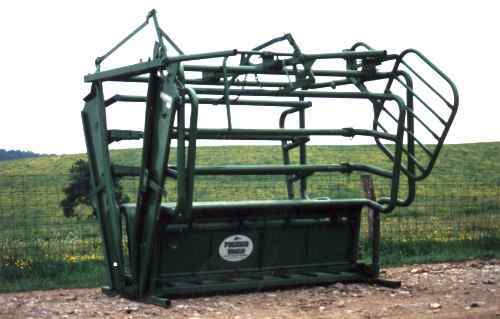 People who are humanely concerned about handling their cattle will feel very secure with this chute. A little over a dozen years ago they designed the Classic Longhorn Squeeze Chute. Most serious Longhorn people already have a Powder River horizontal pipe squeeze chute. Nobody in the industry makes one except Powder River. They weigh 1244 pounds, are 116 inches wide, 96 inches long and 89 inches high. We have never had a problem with our Powder River Longhorn chute, nor have we broken a horn or injured an animal. They are so well designed they work wonderfully well with adult Texas Longhorn cattle. This full size chute is just slightly too big for small calves, but works well for large weanling calves. 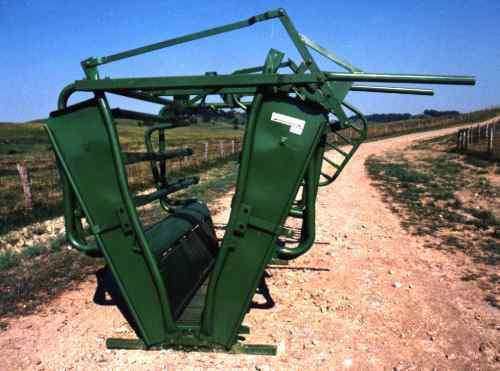 We continuously get calls asking, "What is the very best kind of chute to purchase for Texas Longhorns?" We always tell them, "a Powder River Longhorn chute." Sadly Powder River no longer manufactures the Longhorn Chute. There are some used ones around if you look hard. Please check out the BRY Chute (patent pending) designed by DCC for economy, safety and long lasting, portable use. Recommended for large or no horned cattle.